KANDU Preventative Maintenance Thermography or infrared thermal imaging service is the most cost-effective method in determining faults in all electrical, electronic and mechanical equipment for industrial, commercial and domestic businesses. Infrared electrical thermal imaging can quickly and accurately identify structural issues and problems with buildings and can identify exceptions with heating, lighting and electrical systems and appliances, which are not visible to the naked eye. Electrical Thermal Imaging technology has also revolutionised the approach to preventative maintenance. By pro-active early identification of potentially serious faults before they have a chance to fail, infrared thermography prevents sudden and costly disruption to critical operational and production systems by allowing repairs to be scheduled at a time which is convenient to you. 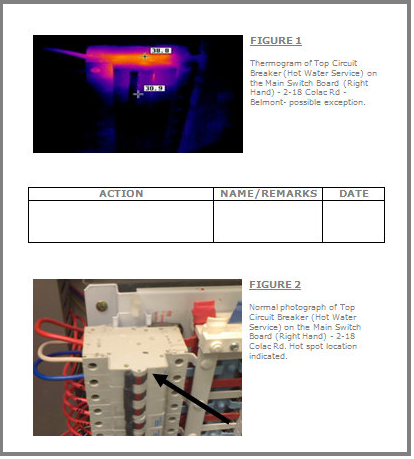 Reveal in seconds abnormal temperatures within an electrical switchboard. Preventative maintenance is cheaper than dealing with a catastrophic fire. Can quickly identify structural issues and problems with buildings. KANDU Preventative Maintenance Thermal Imaging Services are one of the leading suppliers of specialist thermographic services within the Geelong and Melbourne regions and can guarantee independent advice and guidance to meet your individual requirements. KANDU Preventative Maintenance Electrical Thermal Imaging Services prides themselves on providing reports which contain information which will make it easier for you to make decisions. What you will get is a regular photo of the component, light switch, electrical appliance, electrical switchboard and then a thermal image of the exact component from the same angle and distance. The thermal image and photo comparison makes it clear. All of our Kandu Thermographers hold Level 1 Diplomas in Thermography and are members of CITA (Certified Infrared Thermographer’s Association).